The organ was originally built for the Wren church of St George's Botolph Lane near the Monument in the City of London by Abraham Jordan in 1723, for which he was paid £300. Abraham Jordan was not only an organ builder, but also a brewer. 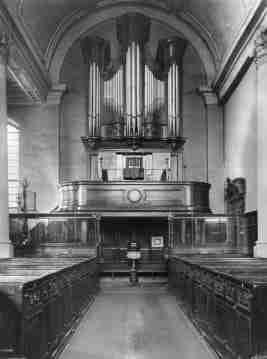 The picture (see below, black and white photo) shews the organ in St George's Botolph Lane, shortly before the church was demolished. 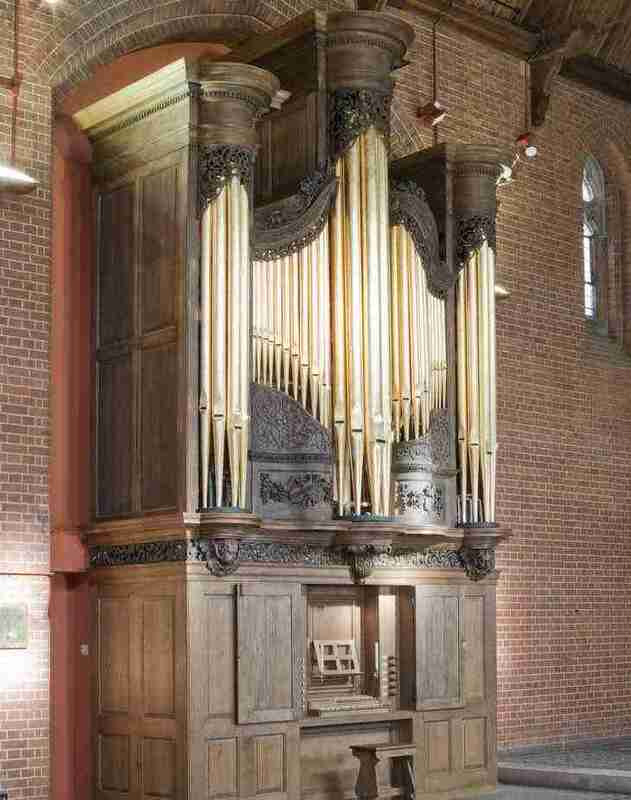 The casework of the organ is an interesting example of the serpentine design which was fashionable in London at the time and used by various organ builders for their instruments. It was fairly typical for its time with the GG to f Great Organ compass and fiddle g to f Swell Organ compass. In 1862, William Hill revoiced the Diapasons and reeds, extended the Swell Organ compass down to tenor c and added a 27 note pedal board with just one octave of Bourdon pipes. Some further minor work was also undertaken by Henry Speechly in 1884. However, by the start of the 20th century, serious structural problems in the church made themselves evident and the buried human remains were thought to be a health hazard. So in 1904, St George's in Botolph Lane was demolished and the parish amalgamated with St Mary at Hill nearby. At about the same time it had been decided to build a new church in Southall, then a mere suburb of London, and it was also to be dedicated to St George. 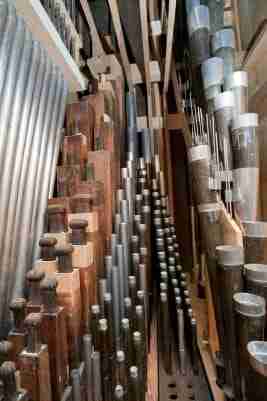 This lead to the organ from Botolph Lane being transferred and altered for St George's Southall. This work was also carried out be Henry Speechly in 1908. The work carried out by Speechly was rather more invasive than any before. The compass of the manuals was changed to the then normal C-g 56 notes, the Swell requiring much new pipework and a new soundboard. The action was also new. More significantly, it was decided to discard the lower portion of the case entirely and to erect the upper part on a shelf above a new console. The upper portion of the casework, albeit altered slightly. The old console music desk panel and console doors. Most of the Great pipework and the Swell Stopped Diapason from tenor b. 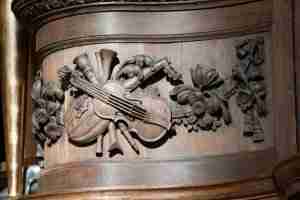 This entailed a great deal of research both into the existing material and other contemporary instruments. The casework was carefully dismantled and repaired. New timber was stained to match the old, with exception of the treble end of the case, where the new timber was left unstained so that the extent of the repairs could be seen. The new lower casework was made in the traditional manner with pegs to hold the joints together and without the use of glue. The new key action was also made in the traditional manner with un-bushed wooden roller studs which are simply knocked into the rollerboard without glue, wire metal roller arms and octagonal section oak rollers. The pipework was carefully restored and much had to be lengthened. As we were not clear what changes Hill might have made in 1862, we did not alter the voicing again as that would have made the work of future historians even more difficult. In fact, we had the impression that very little had been changed. We attempted to reconstruct the original temperament, but this proved impossible. 1/6th Comma Meantone temperament was used after consideration of historic precedence, although it has to be admitted that 1/4th Comma might have been employed originally. We obviously dont know exactly how the swell box was constructed, but it is assumed it was of the Nags Head form. The new Swell soundboard was made in the style of the existing Great soundboard, including the highly unusual double layered table, the first layer being formed by filling in between the bars and the second a more normal table on top of this. The organ has two wedge bellows which can be operated by levers behind the organ and the winding is surprisingly steady. The form of the winding is also the subject of conjecture of course as nothing of the original winding survived. Before the organ was dismantled for delivery to Southall, we held an informal workshop concert for which one piece was played using the hand blowing. A CD made by William Whitehead is due out in the New Year 2011. We particularly relished the challenge of this exacting restoration work as it was an unusual opportunity to be able to restore an early eighteenth century instrument to its original form with very little compromise. View the Specification of the Organ in St George's Southall and St George's Church web site with more photographs of the organ here. (Completed 2009). The pipe scales are here and the restoration report in full is here.